Use a jar or tin of tuna in this quick light supper. Drain and rinse the borlotti beans, then heat them in a saucepan or in the microwave until warmed through. Add the garlic, chilli and lemon zest, then stir in 2½ tbsp olive oil from the jar of tuna; season well. Give the borlotti beans 15 minutes to absorb the flavours of the dressing as they cool. Drain the tuna and break it into large chunks. 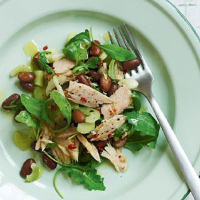 Toss the borlotti beans, celery and rocket in a large bowl, then gently fold in the tuna.